Jennifer Lopez pledged Sunday to donate $1 million from her Las Vegas show to help residents in Puerto Rico recover from Hurricane Maria. Lopez made the announcement at a press conference with Gov. Andrew Cuomo, who announced the state would organize a recovery effort, including information on www.ny.gov that would detail donation collection points and lists of items that needed to be donated. "We have to help Puerto Rico with the same urgency that we're helping Texas and Florida and the other parts of this country that need help," Cuomo said. Lopez, who is of Puerto Rican descent and was born in the Bronx, said she hasn't been able to reach all of her family on the island. "Puerto Ricans are American citizens and today Puerto Rico needs our help. 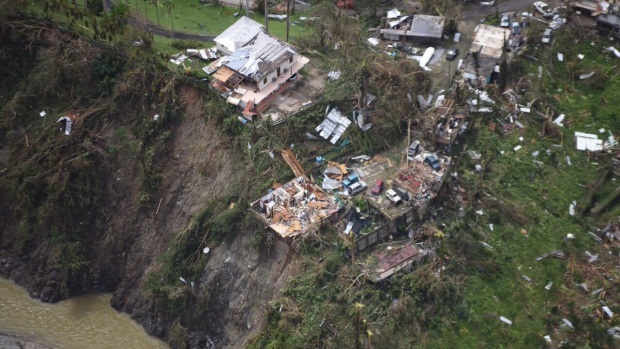 Hurricane Maria has devastated our island," she said. She said that she and MLB star Alex Rodriguez, who is of Dominican descent and was also born in New York, were using their connections in entertainment, sports and business to gather support for relief efforts. Major League Baseball commissioner Rob Manfred and New York Yankees owner Hal Steinbrenner have both committed to giving a "significant" contribution, Lopez said. She added that she and ex-husband Marc Anthony are organizing the Latino community to support Puerto Rico. Across Puerto Rico, more than 15,000 people are in shelters, including some 2,000 rescued from the north coastal town of Toa Baja. Officials were racing to stem a growing humanitarian crisis in towns left without fresh water, fuel, electricity or phone service. Cuomo said it will take billions of dollars in the long term to help the island recover, money that will have to come from the federal government. Taking a shot at President Donald Trump, the governor said, "instead of arguing with football players, instead of obsessing about how to take health care from the poor in this country, why don't we put the politics aside and focus on helping Americans in desperate need."